This morning officially starts my 6th month of boot camp, so that means it is time for my monthly Boot Camp Update! The weight and inches are still coming off. It is amazing how different the results are from month to month. For example, last month my measurements changed the most and my weight barely moved. This month it is totally the opposite. I did have some improvement on my measurements, but it was nothing compared to my weight loss. Go figure, I guess my body just wants to keep me guessing. I am most excited this month about my run time. Since my time for last month was 8:05, my goal was to make it under 8:00. Meaning 7:59 would have made me happy. 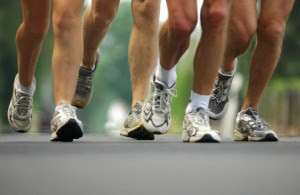 I remember thinking as I was completing last month's fitness test that there is no way I could possibly run any faster. So I was actually worried that I wouldn't make in under 8 minutes. But I ran my heart out, almost literally. My chest hurt, my arms went numb, but it paid off because I ran my mile in 7:41. I couldn't believe it! I cut another 24 seconds off my time. It is amazing how much pressure you can put on yourself! Since this is my 6th month of boot camp I decided that the end of the month would be a good time to post my before and after pictures and my before and after stats. So keep checking back to see possibly some of the most embarrassing pictures of me ever:) One decision I have come to is that I am going to continue boot camp. I have just come to far to stop now and it has become another addiction. Back in May I ran my first 5k and I absolutely loved it! 3.1 miles is not a very far run or walk. The races are usually challenging enough but at the same time fun. Most 5Ks are stroller friendly and sometimes even dog friendly, so this is something the whole family can do together. As a bonus you usually you get a new t-shirt and free food & drink. The unfortunate part is that this hobby can get expensive since the registration fees add up, but the money usually goes towards a great charity and is tax deductible. With the weather getting cooler it is starting to be 5k season again. I wanted to post a list of some of the upcoming Nashville area 5k races. These are just a few races that Mike and I are going to participate in (or like to support), but if you go to active.com you can find several in all areas of Nashville or were ever you live. I don't think I am ready for a 1/2 marathon yet, but maybe one day! I am so lucky to have a husband who's job usually doesn't require much travel. On Thursday however, Mike had to travel to Dallas for a conference. He decided to extend his stay so he could visit with family and meet with a few out of town clients. Since I knew Mike would be gone, I made a phone call to Searcy to see if any of the family would want to come and visit/stay with me. I was very excited that both my Mom and my brother were able to come over for the weekend. I think this was the first time in a long time that it was just the 3 of us together. My dad and sister were greatly missed, but the 3 of us had a great time. I ran across an article in Real Simple entitled "Eerily Accurate Fortunes". 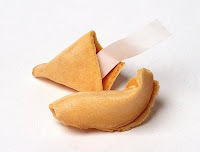 It simply listed 6 fortunes that I found quite amusing and had to share! 1. Your husband will ask the same questions repeatedly, regardless of your answer. 3. You will lose cell-phone reception, only to find it again. 4. You will spend five minutes looking for your keys, only to realize that, yes, they were in your handbag after all. 5. You will have good intentions about going to the gym this week but instead get sucked into So You Think You Can Dance. 6. You will fall asleep during any movie you start watching after 10 p.m.
One of the perks to being a Kroger shopper is the periodic book of coupons that are mailed to the house. Along with the coupons you also receive recipes. Each little booklet usually has a theme ex: organic, breakfast, baking, grilling, etc. Whisk the first 7 ingredients together in a bowl. Combine the pumpkin, brown sugar, honey, soy milk, yogurt, oil, egg & egg white in a bowl & mix well. Add the flour mixture and mix until moistened. Fold in the blueberries & walnuts. Spoon the batter evenly into 12 muffin cups coated with nonstick cooking spray. Bake at 375 for 28 minutes. Let cool for 2 minutes and then remove to a wire rack. If you live in the Nashville area, make plans to attend Phil Keaggy in concert, Wed night, Aug 12. 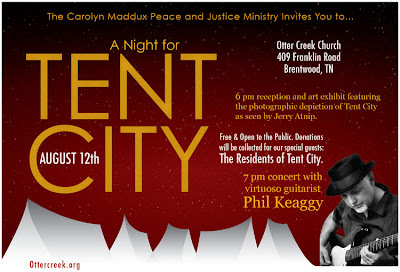 The evening is being organized by the Carolyn Maddux Peace & Justice ministry as a benefit for Tent City. Starting at 6PM come to a reception to view Jerry Atnip’s photography exhibit of Tent City, meet and greet members and guests from Nashville as well as our special guests, the residents of Tent City. The concert begins at 7PM and will end at 8:30. There will be an intermission which will include a video about Tent City and a special announcement about the transfer of the photo exhibit. The concert is free and open to the public. Donations will be accepted for the residents of Tent City. This was what my vehicle looked like at 6:15 am Thursday morning! After completing my hour boot camp session I walked up to the 4-Runner (which was parked at the Brenwood Public Library) and found the passenger side window busted out. I was the victim of a "smash & grab". They took my entire purse. Which happened to be my favorite purse and that favorite purse included all my make-up, my favorite sunglasses, my calendar, my wallet and my cell phone. There was a ton of other items in the purse, but the few that I named are the items I am most angry about loosing. Unfortunately, I wasn't the only victim. Another fellow boot campers car was broken into also. After finding our vehicles in this condition we immediately called the police. I have to give a big thanks to the Brentwood Police Department. They have been great in handling this situation. They were very friendly and informative on the scene and have actually been in contact with us over the last few days. Apparently the guys who did this are pretty stupid criminals, but aren't most? Not only were they spotted in the parking lot by two other runners, who gave a description of the perps and their car to the police. They also used my credit/debit cards and two gas stations that have video surveillance. Mike talked to a lieutenant Friday that said they actually have a suspect. Hopefully the information we have given them will help them build a solid case against these men. So we now just wait and see what happens. I say all this to remind everyone to only keep essentials in your purse. Keep only the credit cards you use in your wallet. If you don't normally write checks, don't keep your check book in your purse. DO NOT keep your social security card, birth certificate, or other important documents in your purse. Also, make a copy of all cards (front & back) and information you keep in your purse/wallet so in the case that this happens all you have to do is pull out the photocopy and start calling all the numbers that are on the back of the cards. This way you will know for sure that you haven't forgotten to cancel anything. Most of this is common sense, but I know several people that literally "live" out of their purse. 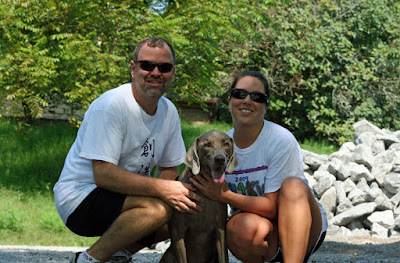 I wanted to let everyone know about the South Nash Dash 5k coming up on September 19th. The race will take place in Lenox Village. It starts at 9:00am and there is a kids fun run at 10:00am. Entry fee is $20 if you sign up before 8/22/09. You can find out more information here. Back in June I posted this post which is a list of 31 Nashville-based restaurants that Mike & I want to try. Due to a very busy summer schedule, last night was the first evening we had available to start on the list. We were originally going to try the restaurants in alphabetical order, but since we had a gift certificate to Mambu, we made that our choice for restaurant #1. We opened the invitation up to several friends to see if they would like to join us for dinner. Unfortunately due to conflicting schedules or just the fact that the invitation was so last minute most people could not make it. But our good friends, Kyle & Janna, were able to come out and play! We had such a great time. The conversation was fun, the food was great, and we were enjoying ourselves so much that after dinner we headed over to another great restaurant, The Bound'ry, for dessert. The Bound'ry is actually one of the restaurants on the list of 31, but since we only had dessert we can't cross it off our list just yet. We will definitely have to go back sometime for dinner. Their menu look amazing! Our plan is to try one restaurant a month until we have tried all 31. So overall restaurant #1 of 31 was a success. I tried to get a picture of the four of us during dinner, but the camera wasn't cooperating. So we had the valet take our picture outside the restaurant as we were leaving. Thanks Kyle & Janna for such a fun evening! After 4 full months of boot camp, the results are in. While my weight is slowly decreasing, I am seeing the most results in my measurements. This month alone I lost another 1.5 inches off my waist and 1 inch off my hips. As far as the strength & endurance portion of boot camp goes, my mile time for the month of July was 8:05. Which means I shaved 17 seconds off the previous month's time. My number of sit-ups stayed about the same, but I did increase the number of push-ups from the previous month. Overall I am happy with the results from the month of July. So happy in fact that I went ahead and signed up for the month of August. I know in my previous boot camp post that I said I was not going to do boot camp anymore, but I changed my mind:) The more I thought about it, the more I realized how worried I was that I would loose everything I worked so hard to achieve. And to be honest, I really love boot camp! I love knowing that by 6:15 in the morning I have already burned about 500 calories and now I have 15 hours left in the day to do whatever it is I need to do. So now it is on to month #5. This month I will be doing 5 days of boot camp per week instead of 4 days/week that I have done the last 4 months. So I will be very curious to see how that impacts my results. If you want more information or would like to sign up for boot camp you can visit http://www.brentwoodbootcamp.com/. I can't end this post with out saying thanks to all the family & friends that have cheered me on throughout the whole boot camp experience. I really appreciate all the kind words, whether it be through email, blog comments, phone conversations, or conversations in person. Thanks a ton!